The 15th Annual Complaints Management Forum for Financial Services took place in London last week (16-17 March 2016). 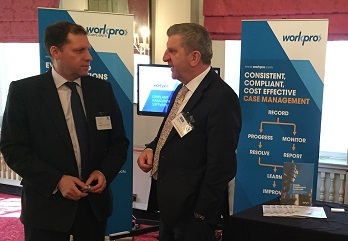 CAS was there, exhibiting our WorkproFS system, Workpro complaints management software for Financial Services. About 100 delegates attended each day. The new FCA rules on complaint handling coming into effect in June 2016 were clearly foremost in delegate minds. Particularly striking was a discussion on the first day about how to interpret the FCA definition of a complaint and the challenge this presents when training frontline staff. With all complaints reportable from the end of June 2016, this is clearly a very important issue. Over-reporting to the FCA was acknowledged to be as much of an issue as under- reporting, with concerns expressed about the scope for subjectivity and degrees of interpretation that can be applied to the definition. Difficulty seems to stem from the definition of “materiality” and how to distinguish a moan or grumble from a genuine complaint. The FCA states clearly that firms must only report complaints that are aligned to the FCA Handbook Glossary definition: 'Any expression of dissatisfaction, whether oral or written, and whether justified or not, from or on behalf of an eligible complainant about the firm's provision of, or failure to provide, a financial service'. They state that in general complaints must allege that the customer has suffered (or may suffer) financial loss, material distress or material inconvenience. Delegates highlighted that not every customer wants their complaint logged, for example due to concerns that this could affect their relationship with their financial provider in future. However, it was agreed that it is important to capture all complaints so that product and service improvements can be made; a key FCA objective and surely a cost-saving, customer-benefiting opportunity in anyone’s book, regulations aside. Alongside the importance of training, a decision tree approach was discussed - using a complaints management system to present frontline staff with pre-defined choices to help them identify and categorise a complaint. Others preferred more autonomy, allowing complaint handlers to use their expertise and judgement to make the decision. It seems to me that organisations working without an active complaints management system are at a disadvantage. Recording complaints is one thing - “processing with purpose” is another. With regulatory guidelines and your own firm’s policy variables accommodated in the rules section, Workpro complaints management software provides staff with guidance in the workflow, prompting decisions and choices with validation rules, while providing appropriate categorisation options. Workpro users enjoy autonomy appropriate to their level of expertise, allowing them to move back and forward between forms and stages as their judgement dictates, all allied to the necessary security permissions. Timeline monitoring creates prompts and alerts. Multiple case type workflows allow staff to capture both reportable FCA complaints, as well as other enquiries, moans or compliments. All data is then available for root cause analysis and to provide management information on demand. For more information on Workpro Complaints for Financial Services, click here.